Home » OSWCC » OSWCC 2010 Summer Social was a big success! OSWCC 2010 Summer Social was a big success! 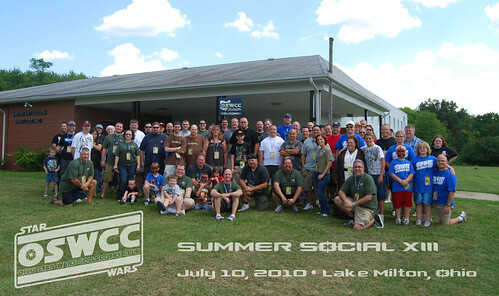 The 2010 Summer Social is now in the books. Thanks to everyone who came out to Lake Milton and spent the day geeking about Star Wars with us. Everyone enjoyed great activities, food, raffle items and sales, special guests, and more. The photo archive will be updated very soon with all the images from the day. Also, a huge thanks to all of our sponsors, who contribute to the success of the event every year! Click here to check out photos from this year’s event, as well as those from past events, on the OSWCC Flickr archive. OSWCC North got together on game day for some Star Wars fun and heated football play off action! Check the pics here. OSWCC heading to Cincinnati Comic Expo & Wizard World Ohio Comic-Con!